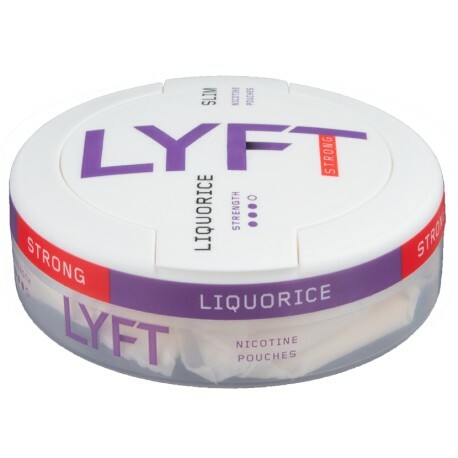 LYFT Strong Licorice Slim All White portions are high nicotine flavorful licorice pouches. From the makers of EPOK, instead of using white tobacco like EPOK, fiber from eucalyptus and pine is used. Aside from the nicotine which is extracted from tobacco, this is an all white tobacco-free product. LYFT Strong Licorice Slim All White Portion is a great licorice all white snus. I, Moe Unz, don't think I could top the manufacturer's product description when they proclaimed (translated into English) Experience how memories are brought to life with LYFT Licorice Strong. Let the aroma and taste of pure licorice with hints of anise, licorice and caramel take you back in time. Feel the round and soft taste explode....I, Moe Unz, have no idea what the this description means but I do find it strangely arousing. Leave your review of LYFT Strong Licorice Slim All White Portion below and don't explode on yourself!